SOLO MAN: John Butler will perform two special solo shows at the Woodford Folk Festival. He last played there in 2012. 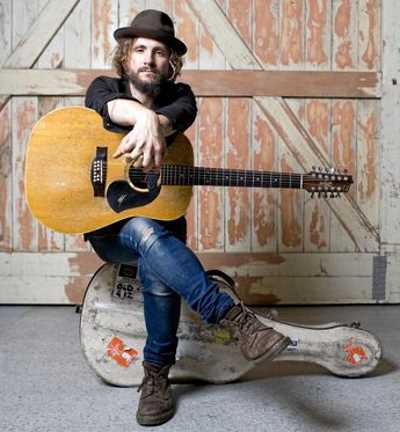 JOHN Butler will treat fans to two rare solo shows at the Woodford Folk Festival next week. The singer-songwriter, who is best known as the frontman of The John Butler Trio, will travel straight from the recording studio where he is working on his new album to headline "the best festival on the planet”. "I don't play solo often,” he said. "It's a rare thing I do every couple years. Butler promises to play at least one song from the yet-to-be-titled album at Woodfordia. "It's definitely an album that has the trio on it, but whether I call it The John Butler Trio or not I don't know,” he said. "This time it's such an insular project for me. Most of the time I've had to be alone and get out all the stuff I hear in my head as purely as possible. Three years on from the release of Flesh & Blood, Butler has been experimenting with programming beats and synthesisers. The new album is likely to be a departure, at least in some ways, from his busking roots. "I'm very wary of throwing the baby out with the bathwater,” he said. "I like what I do, so I don't want to throw those things away but you're always trying to bring the best of what you do - all killer, no filler. Butler, who will also appear on the festival's Speakers Program, said he was creating an album full of love after a dramatic year. "It's been a big year for me personally - an almost exfoliating kind of year: a bit rough and raw,” he said. In August Butler released a stand-alone single, Bully. For an artist who put out his first cassette tape as a busker two decades ago when AOL Instant Messenger was the hottest thing on the internet - long before the creation of Facebook, MySpace or iTunes - streaming is a brave new world. "It was something I didn't see on my next album but it seemed to fit into the context of where the world was at the time,” he said. "Some songs just say 'Hey, you know, I'm written for this time. Don't worry about your time lines. Let me be free'. Apart from a technological and industrial change, the digital world is such an ideological change for the industry. "People said 'Hey this is how I want it'. It's a really powerful time. Woodford will be a family affair, with Butler's wife Danielle Caruana also performing as Mama Kin and their daughter Banjo coming along for the ride.